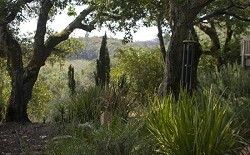 Mediterranean gardening is really a three-way win in Sonoma County. First, it fits--it looks right in the landscape. Secondly, plants for a Mediterranean garden are mostly very water thrifty--they have adapted to survive long hot summers with little rainfall. Last, many plants on the palette are relatively deer-proof, and allow gardeners to "live in harmony with the wildlife". Mediterranean climate is a term derived from those countries bordering the Mediterranean Basin such as France, Spain, Italy, Greece and Morocco. Present on continental west coasts in a band around both the northern and southern 40th latitudes, and associated with five large subtropical high pressure cells of the oceans, the climate also occurs in northern coastal California, South Africa, and small portions of southern South America and Australia. The North Pacific High relates to our climate in California. Mediterranean climate is typically cool and wet in the winter, with infrequent freezes, and warm or hot and dry in the summer, with very little summer rain--just like Sonoma County. There is a large collection of plant species that are well suited to this climate, wherever it occurs.The Mediterranean forests, woodlands, and shrub biome is closely associated with Mediterranean climate zones. Particularly distinctive of the climate are what are technically known as sclerophyll shrublands, and called chaparral in California. The term sclerophyllous refers to a type of vegetation that has hard leaves and short internodes between leaves. The word comes from the Greek sclero (hard) and phyllon (leaf). The foliage often tends to be evergreen, compact in leaf size, grayish or grayish-green in color, and frequently slightly furry. It is this plant structure that reflects light, reduces evapotranspiration and makes the Mediterranean plant types drought resistant. It also allows them to continue to photosynthesize all through the year. Coincidentally, and happily, it is this same structure that makes the plants' leaves less appealing as deer fodder. Few Mediterranean plants can tolerate prolonged or severe freezes, but many can handle the occasional frost. Most are relatively drought tolerant once established, but like well-drained soil. That means that that in places with clay or adobe soils, which occur with altogether too much frequency in Sonoma County, a lot of amending with organic material is necessary. What will grow well for you depends on your specific site and microclimate: soil type, amount of coastal fog, frequency of hot, dry wind, directional sun exposure, amount of slope. While most species are drought tolerant, that does not mean NO water when young or when we have a two-week period of 100+ days. Habitat gardening and Mediterranean gardening are not mutually exclusive, either. Several plants on the Mediterranean list attract beneficial insects, bees, butterflies and hummingbirds, such as: buddleja, lupine, penstemmon, yarrow, rosemary, lavender, citrus and the natives madrone, manzanita and ceanothus. Outside my office window at this moment honeybees are buzzing around the just-blooming lavender, butterflies are in my yarrow and tagetes, and a hummingbird is hovering and sipping from the courtyard fountain. We didn't consciously set out to plant a Mediterranean garden. Our home sits on a bench in the oak woodlands of lower Sonoma Mountain, looking out at the Mayacamas and up at Jack London Park. When we first acquired this magical place, we spent three years camping out most weekends, to learn the lay of the land, the angles of the sun, and the ways of the wildlife. As we watched the elusive silver foxes, the groups of bronze turkeys, the squirrels and jackrabbits, and the dappled fawns with their tawny mothers, we made a decision not to fence off this special place and impede the free movement of all of the lovely wildlife--all of which, after all, has been here much longer than we have. As a result, we've gradually adopted a manner of planting that they just aren't very interested in. We cut the bare minimum of trees necessary to build the house, so it nestled into the woods. Not being gardeners at all in those days, we first decided just to let the oak woodlands grow right back to the house. Well, that wasn't practical from a fire protection standpoint, and, too, we found ourselves, over time, wanting little bits of augmentation to the natural. We soon learned the hard way what the marauding deer, rabbits, turkeys, moles, voles and gophers could do to pretty things we saw and liked in the nurseries, and brought home in early attempts to brighten our plot. We tried placing strategic caches of hay and salt licks at the outer edges of our site, but soon realized we were just attracting more deer. summers to deer-proof, the available plant list grew shorter. Fortunately, much of what was on it were these species whose looks and smells we knew and favored from Mediterranean wanderings, and thus over time we've ended up with native oak woodlands merging into areas of Mediterranean plants: phalanxes of lavender--lavandula grosso and provence, as well as angustafolia and the larger hydrophilia; swaths of dark, pungent rosemary--tall intense-blue flowered Tuscan, the slightly more spreading Arp as well as low, creeping prostrata; drifts of grasses--blue fescue, purple fountain and Mexican feather; and VW sized mounds of orange-flowered tagetes lucida whose sharp smell snakes through the property. Tall conical Italian blue cypress and flashing grey-leafed Manzanillo olives only have to have their trunks protected by wire cages against young male deer antler-rubbing in the fall, and together with various green, bronze, variegated and 'flaming' New Zealand flaxes (phormium) provide armature and structure. Euphorbia, agave, silvery-grey artemisia and santolina also weave into the weft of our woodlands-garden mélange, combining with the natives into a harmonious whole--all of which is of little interest to the deer. Mediterranean plants often have smaller and less showy flowers than those of typical English cottage garden plants, and sometimes none at all--but they frequently wear foliage that is colorful itself at certain times, may feature bright berries--like our native toyon, or sport shapes and structures that are very architectural in nature, such as the agaves, aloe, flax, and even lavender. Bright flowers combined with a mixture of foliage from grey-green to rust, and punctuated with strongly architectural plant-shapes makes for a very interesting whole. 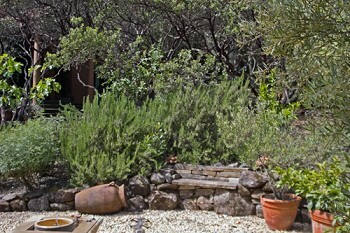 An herbaceous border of creeping thyme, heather, lavender, yarrow, rosemary, miscanthus and flax fronting a dry-laid native stone wall, behind which stretches an upslope of Arbequina olives interplanted with Meyer's lemon bushes, all backed by a row of straight-backed Italian Cypress is a delightful sight. Our garden is not fancy or formal: just a little hardscape, with native boulders and a few multi-ton jobs shifted in during construction, and some nice low dry-laid native-stone walls. This personal-taste combination of natural woodlands, slightly augmented, would never make a garden magazine or garden tour, but suits us, and is consistent with our desire not to wall off our piece of heavenly real estate from the rest of nature's inhabitants, but rather live in relative peace with them. Heidi Gildmeister says in Gardening the Mediterranean Way: "To achieve a true Mediterranean look, it is not necessary to splash contrasting colors around. The foliage of Mediterranean native plants is mostly evergreen, and green alone can achieve a restrained contrast that imparts a natural look. . . .Consider subtle contrasts that complement each other or set each other off. . . . Color in itself is not always beautiful: it is what we do with it that creates beauty." I can heartily recommend the Mediterranean-style garden, for its easy and natural-feeling integration into our local landscape, for the water-wise and wildlife friendly nature of its plant list, and for the beauty and harmony it can provide when intelligently and prudently designed.